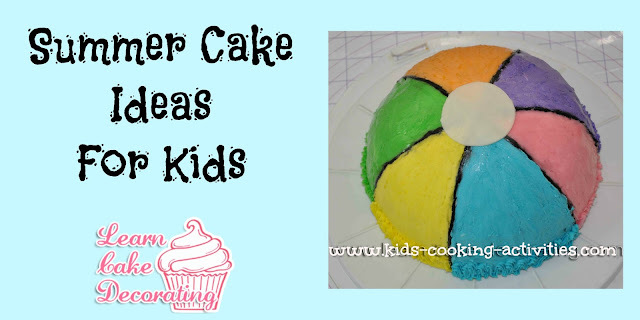 We have three ideas to end your summer with some fun cake decorating ideas for you and your kids- Swimming Pool Cake, Beach Ball Cake and a Flip Flop cake. Bake a cake for a 2 layer round cake. Allow to cool and fill your cake layers. Add a layer of frosting along the sides. Frost the top of your cake blue and wavy for a water look. 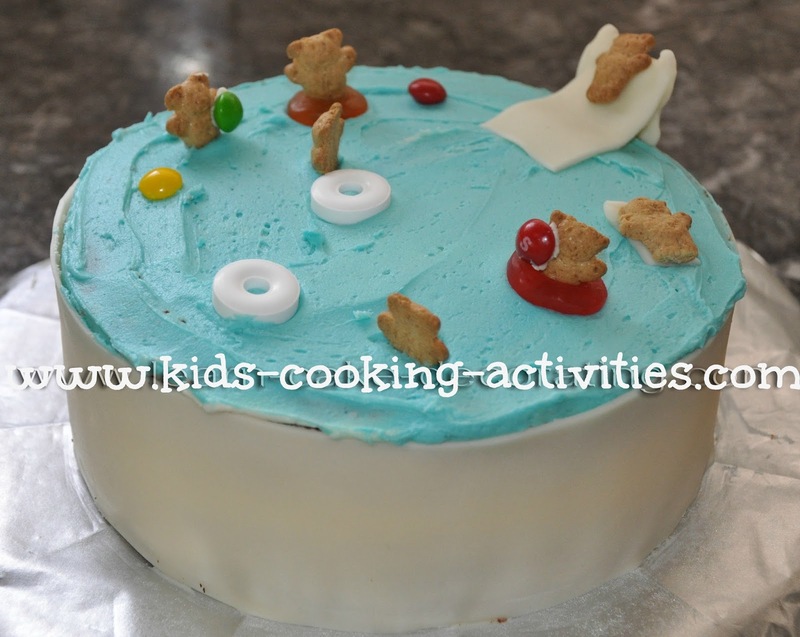 Measure the sides of your cake and cut fondant strips to fit the sides of your pool. Add details as you'd like. Create a slide from fruit strips or fondant place along edge of pool, running down into blue icing. Also place teddy bear crackers in the blue icing. Add more details as you'd like such as lifesavers, gummy savers, skittles for beach balls, etc. 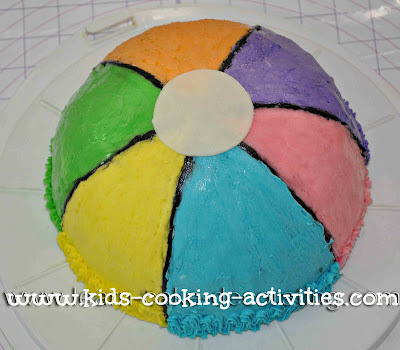 Prepare your icing colors and bags in the colors you'd like your beach ball to be. This cake was made into an ice cream cake so we had to work fast. First crumb coat, add a layer of frosting to your cake. With a clean ruler divide and make a straight line where you want your stripes to be. Using black frosting and a round tip make black lines. Or white lines if you prefer. Start filling in your ball color by color. I finished each color with a zigzag design on the end. To smooth the color, I added frosting in a sloppy fashion and smoothed it with a wet finger or knife dipped in water. If you are piping stars it will just be a matter of piping stars within each stripe. To finish it off, I cut out a circle using a cookie cutter and a small piece of white fondant. 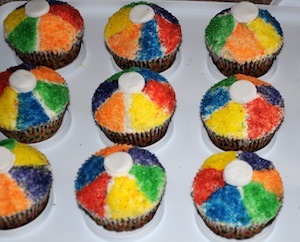 Using food coloring gels, color white sugar in colors you'd like for the beach balls. Make a ball template out of waxed paper by drawing 6 triangles and cutting one triangle out. 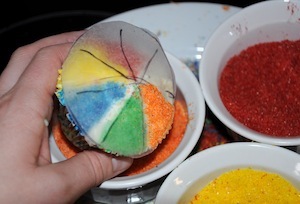 Lay your template on a frosted cupcake and sprinkle colored sugar in each section moving cut out section as you go around the cupcake. Top with a small circle out of white fondant. You can also do this technique using colored icing rather than colored sugar. Using long loaf pans bake cakes according to package directions. Allow the cakes to cool before you cut your flip-flops. The process of shaping can be difficult for complex cakes – especially if you’re a cake-decorating novice, but the simple flip-flop design shouldn’t give you much trouble. Create a template by tracing a large flip-flop onto a piece of regular or wax paper. 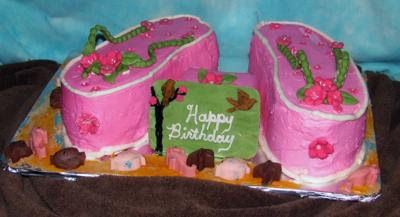 Using a sharp knife, cut around the template placed on the cake. Frost your flip-flops in the color of your choice, using piping tips add additional details and designs. Designs could be polka dots, plain color, stripes, squiggly lines. Thick piping tips are suitable for the straps or, for an extra burst of flavor, apply strips of taffy, licorice or fruit roll-ups. Be as creative as you want – using these or other candies to form stripes and other patterns on your flip-flops. With the flip-flips decorated, you’re ready to move onto the base. To decorate like the beach sprinkle crushed graham crackers over a basic white frosting surface and position your flip-flops on top of the “sand;” personalize with writing or other decorative details. Enjoy these fun ideas to celebrate your busy summer!